The WikiLeaks account at Twitter published two paragraphs that suggested Iran was not concerned about who would win the 1980 election. If the assessment is true, then the Iranians were wrong: the new administration escalated the Iran-Iraq War by supplying both sides. The result was an eight-year blood bath. Julian Assange and WikiLeaks could learn a lesson from their own Tweet, namely, that elections matter and both parties are not the same. WikiLeaks members seem to believe that the US election offers them an opportunity to further humiliate the US government in general and the Democratic candidate in particular. Julian Assange has said that he “believed naively that the neocons were deeply Republican,” but now he believes that Hillary Clinton “brought all the neocons onto her side.” Julian Assange is determined to be remembered as the man who brought down the Democratic Party in the US. There is no sign that WikiLeaks is concerned that, if elected, businessman Donald Trump would adopt a tougher approach to the Iran situation and, in fact, that Julian Assange claims he does not care who the next President will be — even as WikiLeaks only criticizes one candidate in the race. Deep state psychological operative Steve Pieczenik said in early November that he was working with Julian Assange to prevent a “coup” by deep state Hillary Clinton and was promoting a “counter coup” with Julian Assange to help the Republican. Turns out that it matters who becomes president. When Julian Assange chose to criticize only one side, he indicated that even he preferred one side over the other. Apparently, he still does, as he cannot pull himself away from focusing on Democrats or “liberals” even though Republicans hold all major bodies of government. In 1980, Ayatollah Beheshti was wrong. Ronald Reagan stepped up the destruction of the Middle East by pursuing a policy of supplying both sides of the brutal Iran-Iraq War. Over those eight years, hundreds of thousands or perhaps more were killed. In 2016, Julian Assange was wrong. In just six months, Donald Trump and the Republicans have made it clear that the two sides are different — and we are only six months in. History shows that, over time, these differences are huge. Extended coverage below. Republican Ronald Reagan replaced Democrat Jimmy Carter and changed many things. 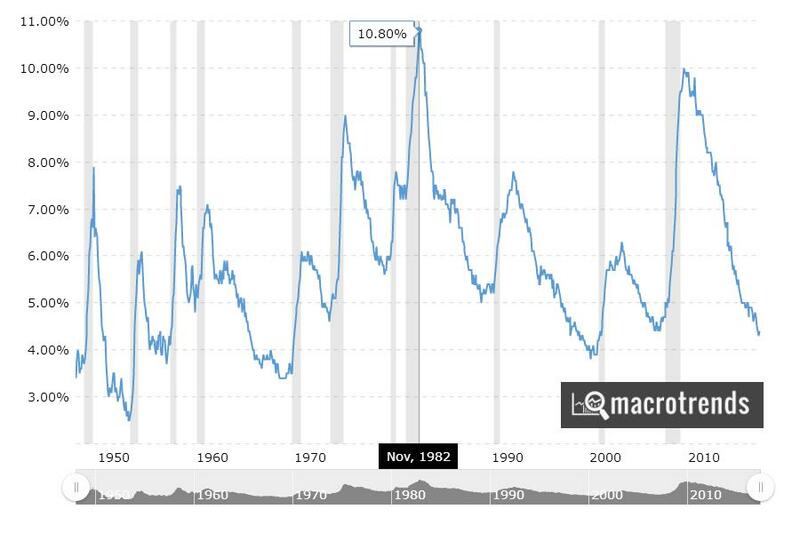 Ronald Reagan’s Federal Reserve squeezed the money supply so tight that it produced the worst unemployment since the 1930’s Great Depression. Ronald Reagan changed the tax code dramatically, ending up after eight years with major tax cuts to the rich, but leaving overall or average tax rates about the same. Following the tax cut and money squeeze, wages stagnated despite rising productivity. Ronald Reagan fired air traffic controllers and broke up unions. Ronald Reagan undermined agencies including the NLRB to ‘get government out of the way.’ Ronald Reagan deregulated the media and permitted the sale of “the big three” networks to large industrial conglomerates. Ronald Reagan deregulated banking and interest and caused the biggest financial scandal in history up to that time — the Savings & Loan crisis. Deregulation caused many problems. Ronald Reagan and his successor Republican George Bush negotiated the NAFTA “free trade” agreement, which Democrat Bill Clinton approved. Wars by Ronald Reagan appeared relatively small or clandestine thanks to “Vietnam Syndrome,” but his build up of the military was necessary for future actions. Finally, Ronald Reagan was the first to balloon the national debt since World War II. Ronald Reagan’s actions produced real differences — real differences that harmed real people, and most have not been corrected to this day. If the 1980 election had come out differently, it is unlikely that most of these things would have happened — and therefore could not have been ‘continued’ by Democrat Bill Clinton. Given that actual voters supported the Republican Party of oligarchy in elections, room opened for upcoming Democrats to move toward the establishment and reap the personal benefits of big bank funding while trying to pick off a sliver of active “moderate” Republicans and win back “Reagan Democrats.” Moderate “third way” Democrat Bill Clinton spent his first two years largely appeasing Republican oligarchs — supporting NAFTA and ‘failing‘ on a national healthcare plan. Democrats were discouraged. The Congress went to Republicans in 1994. For the next six years, the agenda signed by Bill Clinton was very much Republican — death penalty and material support law, copyright extension, welfare restructuring, more banking deregulation, wars in Yugoslavia (with Republicans sometimes posturing as opposition even though they wrote the post Cold War doctrine), and the centerpiece of the new oligarchy: the telecommunications act. However, Bill Clinton refused to escalate the fermenting situation in Iraq. Despite all his compliance, Bill Clinton and his wife Hillary were personally chastised by Republicans nonstop. Fox News was created. Republican Senator Dan Burton called the president a “scumbag.” Bill Clinton was impeached and tried in the Senate for “sexual relations” and related “obstruction” charges. Republicans were gaining many oligarch dream projects, yet they attacked the Clintons ruthlessly anyway — but only in superficial ways and only for partisan political advantage. When Democrat Barack Obama won in 2008, there was much misguided excitement about “hope and change.” Over the next eight years, six years with an unfathomably obstructionist Republican Congress, Barack Obama continued far too much of the agenda from the past Bush years. Barack Obama often held the line, but sometimes expanded those policies. Nevertheless, some positive changes occurred. While holding the line is not too pleasant, after the severely reactive turns of Ronald Reagan and George W. Bush, a Donald Trump administration should have been predictable. Giving up our most basic ISP data to the big cable companies to sell. Today, Julian Assange lingers in captivity at the Ecuadorian Embassy in London because Donald Trump refuses to vindicate him. Despite this, Julian Assange continues to see mostly Democrats as the problem. He acts like the Trump administration are his buddies. Julian Assange has not learned basic facts from history. No two people are alike. Both parties are not the same. The presidency matters. Real people are harmed when reactionary policies take hold. Periods of no progress are better than periods with emboldened reactionaries. When people have to protest and fight just to hold on to what already is, progress becomes virtually impossible. Reactionary changes cement themselves into government and become hard to overturn. In these times, real people are harmed — some more than others. Many otherwise intelligent “progressives” fervently believe that a “third party” assault against establishment Democratic Party may produce progress. At election time, it never does — not one single time since the two-party system aligned before the Civil War. When former president Theodore Roosevelt created the Bull Moose party and ran for election in 1912, he gained 27 percent of the vote. He lost. That was the best performance. In 2000, a team of well-known highly-respected personalities campaigned from the Green Party. Legendary consumer advocate Ralph Nadar and his running mate intellectual talk show host Phil Donahue earned less than three percent of the vote. With this history, life long independent Bernie Sanders tried something different — running inside an established party. He is still working to change the party. Progress is made through growing counter-cultures and subcultures, sustained protesting and non-violent civil disobedience, legal challenges, large boycotts and strikes, and — yes — condoning the “lesser of two evils” with constructive criticism and infiltration rather than wholesale personal attacks. Rubber stamping the worst of “evils” only fast-tracks the damage. This is our history since Ronald Reagan. Time to learn from it. It is fine to imagine that an over-stressed population would finally join a third party movement or revolt against the system and produce positive change. But, in the cloudiness of revolution, unpredictable things happen. As seen in Syria, Yemen, Ukraine, Egypt, etc., the revolution may not end well — and it could end in catastrophe. As economist Milton Friedman said, “Only a crisis, actual or perceived, produces real change. 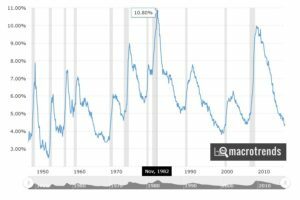 When that crisis occurs, the actions that are taken depend on the ideas that are lying around.” The type of “real” change that our current set of business oligarchs would like involve the deconstruction of regulation and benefits, and expansion of wars. In response to the current situation, famous author Naomi Klein rushed out her recent book, “No Is Not Enough, Resisting the New Shock Politics and Winning the World We Need,” to help prepare the population for any surprises. Watch her interview here. 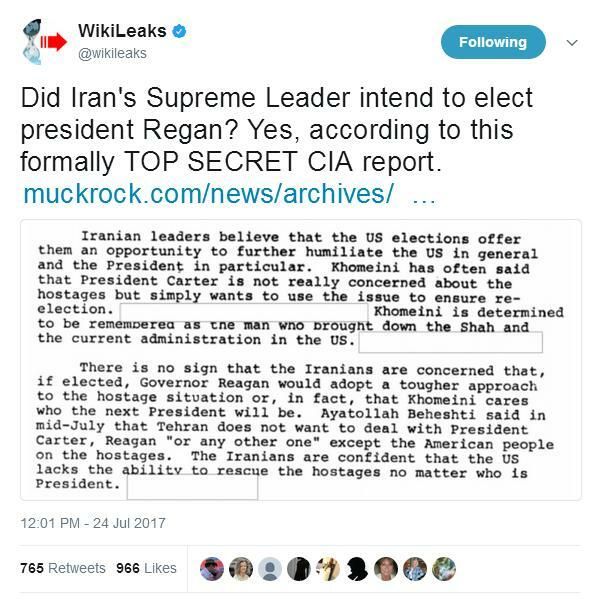 Did Iran’s Supreme Leader intend to elect president Re[a]gan Yes, according to this formally (sic) TOP SECRET CIA report. Iranian leaders believe that the US elections offer them an opportunity to further humiliate the US in general and the President in particular. Khomeini has often said that President Carter is not really concerned about the hostages but simply wants to use the issue to ensure re-election. [Redacted] Khomeini is determined to be remembered as the man who brought down the Shah and the current administration in the US. [Redacted]. There is no sign that the Iranians are concerned that, if elected, Governor Reagan would adopt a tougher approach to the hostage situation or, in fact, that Khomeini cares who the next President will be. Ayatollah Beheshti said in mid-July that Tehran does not want to deal with President Carter, Reagan “or any other one” except the American people on the hostages. The Iranians are confident that the US lacks the ability to rescue the hostages no matter who is President.